December is the best time of year to reflect on the past year and begin planning an even better upcoming year. 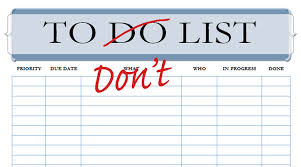 One of the most valuable tools you should implement this December is your Not-To-Do list. This process of thinking through all of the things, or activities, or habits that you would like to get rid of, or no longer do, can be much more freeing and productive than the typical list of New Year’s goals and resolutions. I will stop looking at my emails all day in a continuous, reactive manner. I will not check Facebook more than once per day. I will not skip the gym during the week because I keep choosing to work late. I will not lose valuable family time by doing yard work on the weekends. I will not “veg out” in front of the TV every night of the week. I will not spend time with people I do not enjoy being around. I will not waste money on things that are not connected to my most important goals. I will not have my children stare at the iPad or watch TV just because it is easier for me. Step 2: Choose your top twelve. Now that you have a master list, choose the top twelve. It is extremely important to narrow your focus, even though you would love to stop doing everything on your list. Creating new habits, and eliminating old ones, can be very difficult. By choosing twelve, this will allow you to tackle three each quarter of the year. This keeps your goals realistic and achievable, while building momentum throughout the year. I will schedule three 30-minute blocks of time each day to check and respond to emails. I will notify all of my co-workers of these times and turn on an auto-responder in my Outlook. I will spend 30-60 minutes each weeknight before bedtime reading a book or playing games with my children. I will hire a yard maintenance company to come every other week so I can spend more quality time on the weekends with my family and friends. To truly create a new habit, you must repeat it 21 times. So stay persistent and be consistent. It is better to only work on three items and accomplish them all, than to tackle all of them at once and not accomplish any. Each quarter, choose three more items on your not-to-do list and follow step three above. By the end of you year, you will have eliminated twelve things in your life that caused you frustration and your life will be tremendously more enjoyable, productive and fulfilling! Please share in the comments some of your not-to-do items. We would love to hear and share in your growth! This entry was posted in Your Not-To-Do-List and tagged developing a plan, goals and dreams, Life - work balance, Personal growth, Planning for the future, success. Bookmark the permalink.